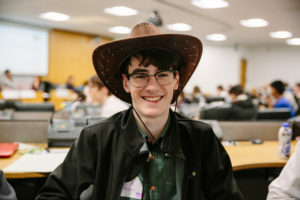 MockCOP: Students from schools across Wales gather to have their say on climate change. 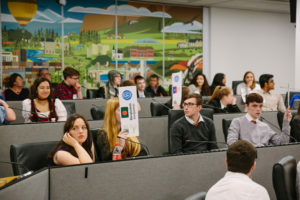 Many thanks to Heini Evans from WWF Cymru for this blog post about MockCOP. 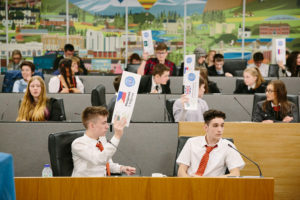 MockCOP provides a platform for students to debate and vote on global issues – a rare opportunity for many 14-18 year olds. 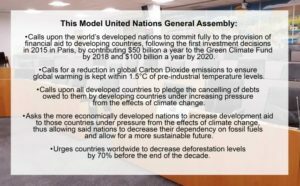 Held at a debating chamber in Cardiff, the event replicates the United Nations climate change conference. Students become delegates for the day and must agree to a resolution on climate change issues. The annual event is organised by Size of Wales. We’re excited to attend this year as Tanya Steele, CEO of WWF UK, takes on the role of Secretary General. 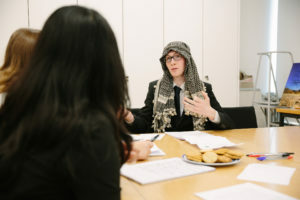 The role involves chairing the event and managing the discussions and debates. The students arrive. They’re chatty and eager as they take their seats. Students are split into small teams – each team representing a different nation. They have prepared and researched their position on climate change for the debate. 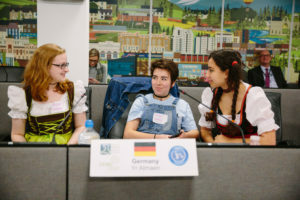 Committed to their delegate roles, students even dressed in traditional costume. It soon becomes clear that this really helps to get them into character. Delegates from all nations begin the debate vocalising concerns around enforcing ambitious targets on developing nations. There is also disagreement among developed nations around how much development aid funding should be made available. Questions are also raised around the use of funds, with concerns around corruption. Delegates suggest addressing this through investment in technology rather than cash contributions; which has both beneficial outputs globally and locally. They also stress that if no agreement is met, money still needs to reach countries most at need to relieve suffering. 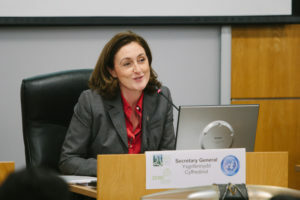 A number of delegates move the focus of the debate to the decrease in deforestation. 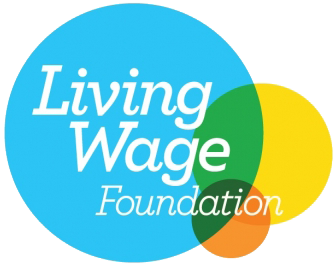 They see this as the most achievable resolution and the one which could have the biggest impact. They also see reforestation as equally important. Many delegates now suggest setting targets for tree planting. Negotiations begin in a separate room between certain nations but representatives from delegations continue a debate in the chamber. They are negotiating the terms of the original resolution. With everyone now returning to the debating chamber, it’s time to vote! There’s further discussion throughout the voting stage. This results in a few changes to the original proposed resolutions. That the world’s developed nations commit fully to the provision of financial aid to developing countries, following the first investment decisions in 2015 in Paris, by contributing a %age of their respective GDP to the GCF to reach $50 billion by 2018 and $100 billion by 2020. Nations are free to pledge a higher %age if they wish. A reduction in global Carbon Dioxide emissions to ensure global warming is kept within 1.5°C of pre-industrial temperature levels. That all countries worldwide to decrease deforestation levels by 70% and calls upon all developed countries to boost global reforestation levels through direct planting and/or investment by 30-40% before the end of 2019. The only resolution which was voted against was to increase development aid to developing or non-developed nations. Use of public transport should be encouraged more to reduce emissions. Sheep farming in Wales is inefficient. Farmers are currently keeping land bare, resulting in a lack of biodiversity. A change in how we subsidise farming in Wales is needed to tackle current land use and increase carbon absorption. There should be higher tax on fuel to subsidise investment in electric cars. Raise the carrier bag charge to 10p to further reduce plastic use and production. Reward those who switch to electric vehicles, through offering a grant to help switch or lowering the overall cost of electric vehicles. Increase awareness of climate change in Wales. Focus on how climate change affects us. Through this approach, they hope to reach those who aren’t motivated by the global impact. Push the message of how close we are to the point of no return and how severe climate change is now. Cardiff is currently the fastest growing city in Europe but most of the growth is happening outward into green-field sites. They’d like to see the growth focused in the brownfield sites. We’ve certainly learnt a lot from the students today. We will make sure that their voices and concerns are now heard in COP23, Bonn and beyond. “There is no doubt that these young people have put incredible research forward and have articulated it really well. It’s been hugely impressive to hear so many young people both understand the issues and, most importantly, put forward proposals for the future. Catch the coverage of the event and interview with Tanya on Made in Cardiff TV. 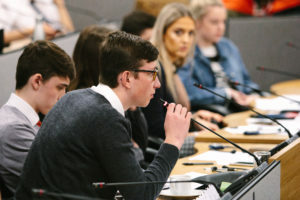 Keep your eyes peeled in the coming weeks as we at Size of Wales publish a full breakdown of the event and what Wales’ young people think about climate change and the steps we as a nation should be taking to protect the planet for their future. Six million trees planted in Uganda thanks to Size of Wales and support from the people of Wales.COP23 – will it be enough?